'I couldn’t turn the pages fast enough . . . a terrific debut' – Jenny Blackhurst, author of Before I Let You In. The only thing more dangerous than a lie . . . is the truth. When a family man is killed at point blank range in his home, it shakes a sleepy town to its core. The murder is a strange, horrifying crime but for the authorities it’s an open-and-shut case. Ten years on, the victim’s daughter, Josie, has started afresh in New York – far from the tragic events that blew her family apart. No-one knows the truth about her previous life, not even her fiancé. Investigative journalist Poppy is convinced the wrong man is in jail for the murder and she’s determined to prove it. What starts off as a true-crime podcast snowballs into a national phenomenon and everyone has an opinion on the case. Poppy’s relentless pursuit of the truth threatens to expose old secrets. Josie realizes that her father’s murder could have consequences more devastating than she had ever imagined. 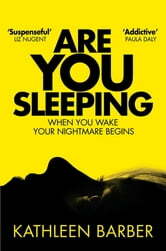 Are You Sleeping is a gripping debut psychological thriller from Kathleen Barber for fans of Serial, Disclaimer and Luckiest Girl Alive. Oscar winner Octavia Spencer will be starring in the TV adaptation, produced by Reese Witherspoon.